GLOBAL AWARENESS 101 - Let your VOICE be heard and get involved. OUR future depends on it! : PAPUA NEW GUINEA: A Massive 7.5 Magnitude Earthquake Rocked The Nation On Monday, Leaving 30 Dead, 300 Injured, Extensive Property Damage Throughout The Island. PAPUA NEW GUINEA: A Massive 7.5 Magnitude Earthquake Rocked The Nation On Monday, Leaving 30 Dead, 300 Injured, Extensive Property Damage Throughout The Island. Sydney – More than 30 people are believed to have died after a powerful earthquake struck Papua New Guinea's (PNG) mountainous interior, a report said on Tuesday as details of "extensive" damage began to emerge. The 7.5-magnitude tremor struck 90km south of Porgera in the Pacific nation's Enga province early on Monday, with two strong aftershocks rattling the rugged region. 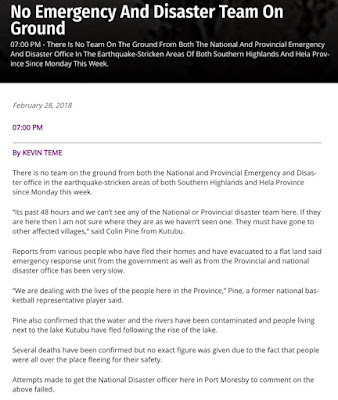 A government assessment team was due to fly into the area on Tuesday to get a better idea of the impact, with the military mobilised to help restore services and infrastructure, the government's Chief Secretary Isaac Lupari said in a statement. "Information will be provided as this is made available from assessment teams in the area," he added. 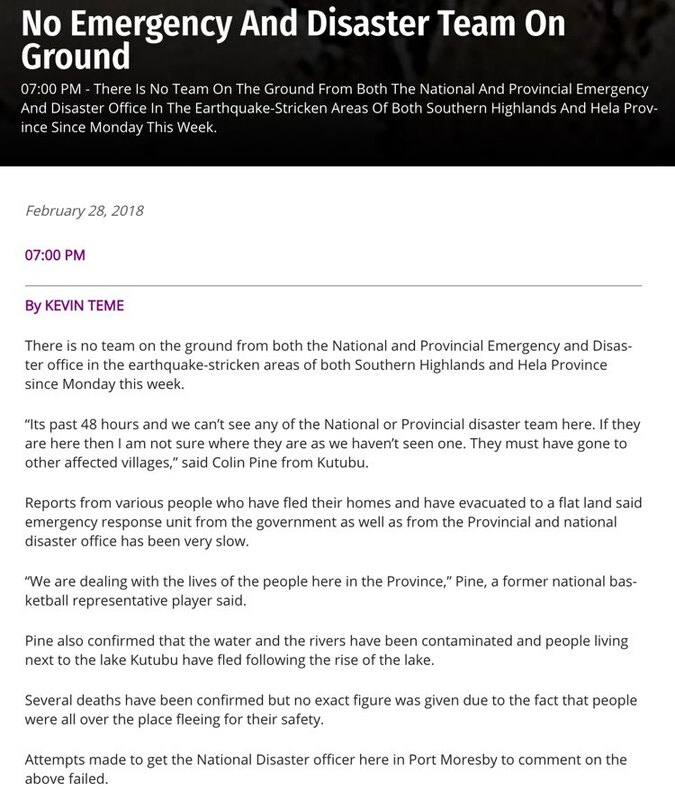 "The scale of damage, from information we are getting from the ground, is quite extensive," he said, adding that there were around 19 landslides between Mendi and the town of Mount Hagen. "Our police station, courthouse, hospital ... even private houses have been ripped apart or sunk into the ground. "It's going to be a massive recovery exercise." The tremor hit at a depth of 35km around 03:45, US seismologists said, with aftershocks of 6.0 and 6.3 magnitude recorded. "We could feel the house and the earth shaking, we wanted to run for the door and out of the house, but it was too late," she said, fearing that if they went outside "the ground might open up and swallow us". The thatched roof on the house she was in collapsed "but we didn't care, we just clung to each other and waited for the shaking to stop". "When we came out we barely recognised everything around us, nothing was familiar to us. The house or tree that was there wasn't there anymore," she added. Whole villages have been flattened and water sources spoiled by a powerful earthquake that killed at least 20 people in Papua New Guinea's remote, mountainous highlands. The magnitude 7.5 quake rocked the rugged Southern Highlands province some 560 km northwest of the capital, Port Moresby, triggering landslides, damaging mining, gas and power infrastructure, and cutting communications. Scores of aftershocks have hampered rescue efforts and rattled nervous villagers over the past two days, including a 6.0 tremor just before 1 pm local time registered by the US Geological Survey. "It's massive destruction," Stanley Mamu told Reuters by telephone from Tari, 40 km from the epicentre. One person was killed in Tari and another five were killed in a landslide in a nearby village, he said. Australia has sent a C-130 military transport plane to help with aerial surveillance. Miners and oil and gas companies are also assessing the damage, which includes ensuring a 700-km gas pipeline that connects to a coastal liquefaction plant is intact.d. "We are really in deep fear," said police sergeant Naring Bongi. "It continues to be active. We didn't sleep well and stayed awake until daybreak ... no helicopters or government officials have come to our assistance."